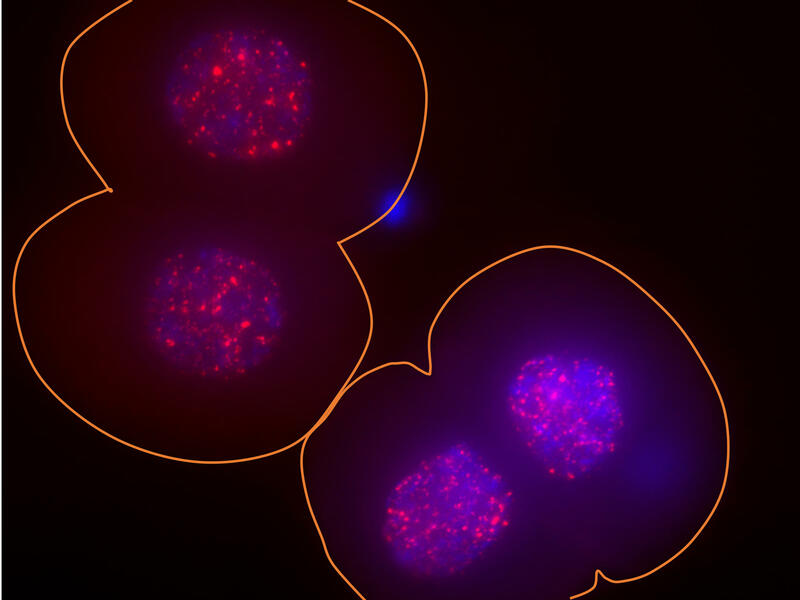 In these two two-cell mouse embryos, the surface of the embryos is outlined in orange, the DNA in the nucleus is indicated in blue and the activity of the LINE-1 gene is indicated via bright red spots. The noted biologist Barbara McClintock, who died in 1992, discovered these odd bits of DNA decades ago in corn, and dubbed them "jumping genes." (She won a Nobel prize for that finding in 1983.) McClintock's discovery stimulated generations of scientists to seek to understand this bizarre phenomenon. Some biologists have considered these weird bits of DNA parasites, since they essentially hop around our chromosomes and infect them, sometimes disrupting genes and leaving illness in their wake. But Miguel Ramalho-Santos, a biologist at the University of California, San Francisco, doesn't like that narrative. "It seemed like a waste of this real estate in our genome — and in our cells — to have these elements and not have them there for any particular purpose," Ramalho-Santos says. "So we just asked a very simple question: Could they be doing something that's actually beneficial?" He and his colleagues focused on a jumping gene called LINE-1; all told, copies of it make up a whopping 20 percent of our entire DNA. Ramalho-Santos' lab studies embryos, so the team wondered whether LINE-1 played any role in prompting a single fertilized egg to develop into an embryo. Normally, when biologists want to study one bit of a cell's genetic material, they find a way to eliminate it to see how the cell behaves in its absence. That's impossible to do in the case of the LINE-1 genes, since that would mean editing out 20 percent of the entire genome, notes postdoctoral researcher Michelle Percharde. Instead, the scientists devised a way to silence this abundant DNA inside the cells of a mouse embryo to see what would happen. "What we found was that, instead of it being good for the cells," she says, "the cells did very poorly." In a series of experiments published in the journal Cell, the scientists conclude that LINE-1 seems to be essential in the earliest stages of an embryo's development. "That's a very key role," says Ramalho-Santos, "because, as you can imagine, if you can't make a tiny little embryo — if you can't make embryonic stem cells, which are the cells that give rise to the entire body — you don't have any body." His team's discovery hinged, in part, on developing new lab techniques, but Ramalho-Santos says that's not all. "I think the biggest advancement here was actually a mentality shift." What's been commonly dismissed as "junk DNA" does clutter the genome, and it's clear that it can also cause harm. But Ramalho-Santos argues that biologists should also think harder about its function. Nels Elde, an evolutionary biologist at the University of Utah, agrees — up to a point. "I might be a little old-fashioned, but I'm still holding onto this notion of junk DNA," Elde says. "Think of it this way. If you come into my office and look at the desk, you'll look at it and say, 'This thing is strewn with junk.' And I may say to you, 'Actually that's a very customized filing system that you're looking at.' In fact, I think we're both right." Elde believes that these repetitive bits of DNA (known technically as transposable elements) exist primarily because they cut and paste themselves throughout the genome. They reproduce. And in that sense they are parasites. Sometimes they cause disease by disrupting the DNA where they insert themselves. But sometimes the mutations they cause can lead, for example, to new varieties of crops and new breeds of dogs. "You can make massive genetic jumps — just in single events — that can really change the course of an entire species," Elde says. From the point of view of an evolutionary biologist, that's enough reason for them to exist. But it's increasingly clear that there's even more to the story of these jumping genes. "These things may be repurposed" to perform other functions in the cell, Elde says. "And that's what we're starting to discover, and that's what [the new research] paper begins to tackle as well." Ramalho-Santos is pursuing these questions as he moves his lab to the University of Toronto, and Percharde says she plans to keep exploring these questions, as well. Her postdoctoral fellowship is now at an end, so she's moving back to London to continue her research career. The two are not alone in finding this a fruitful line of research. Elde says this idea is starting to gain momentum, as scientists figure out new ways to explore this fascinating realm of biology. One of the enduring mysteries of biology is why so much of the DNA in our chromosomes appears to be simply junk. In fact, about half consists of repetitive bits of DNA that cut and paste themselves randomly in our genome for no obvious reason. A new study finds that these snippets may actually play a vital role in the development of embryos. NPR's Richard Harris reports. RICHARD HARRIS, BYLINE: Some biologists think of these weird bits of DNA as parasites since they essentially hop around our chromosomes and infect them, sometimes disrupting genes and leaving illnesses in their wake. But Miguel Ramalho-Santos, a biologist at UC San Francisco, doesn't like that narrative. There's so much of this stuff. Surely there's more to the story. MIGUEL RAMALHO-SANTOS: So it seemed like a waste of all this real estate in our genome and in our cells to have these elements and not have them be there for any particular purpose. So we just asked a very simple question. Could they be doing something that's actually beneficial? HARRIS: Ramalho-Santos' lab studies embryos, so they wondered whether some of this so-called junk DNA played any role in triggering development. The scientists devised a way to shut down this abundant DNA inside the cells of a mouse embryo to see what would happen. Postdoctoral researcher Michelle Percharde was part of the team. MICHELLE PERCHARDE: What we found was that instead of it being good for the cells - they're like, oh, thank you - the cells did very poorly. HARRIS: In a series of experiments now being published in the journal Cell, the scientists concluded that one common form of this junk DNA seems to be essential in the earliest steps when a fertilized egg starts to become an embryo. RAMALHO-SANTOS: So that's a very key role because as you can imagine, if you can't make a tiny little embryo, if you can't make embryonic stem cells, which are the cells that give rise to the entire body, you don't have any body. HARRIS: This discovery hinged in part on designing new technology. But Ramalho-Santos says that's not all. RAMALHO-SANTOS: I think that the biggest advancement here was actually a mentality shift. HARRIS: Junk DNA may clutter the genome, and it's clear it can also cause harm. But scientists should also think more about its benefits. Nels Elde, an evolutionary biologist at the University of Utah, agrees up to a point. NELS ELDE: I might be a little old-fashioned, but I'm still holding on to this notion of junk DNA. Think about it this way. If you come into my office and look at the desk, you'll look at it and say, this thing is strewn with junk. And I might say to you, actually, that's a very customized filing system that you're looking at. In fact, I think we're both right. HARRIS: Elde believes that these repetitive bits of DNA exist primarily because they cut and paste themselves throughout the genome. They reproduce. In that sense, they are parasites of a sort. And sometimes they cause disease, but sometimes they can cause mutations that lead, for example, to new varieties of crops and new breeds of dogs. ELDE: You can make massive genetic jumps just in single events that can really change the course of an entire species. HARRIS: From the point of view of an evolutionary biologist, that's enough reason for them to exist. But it's increasingly clear that there's even more to the story of these jumping genes. ELDE: These things might be repurposed or co-opted to actually provide housekeeping or daily cell functions. And that's what we're starting to discover. That's what this paper begins to tackle as well. HARRIS: Elde says this idea is starting to gain momentum as scientists figure out new ways to explore this fascinating realm of biology. Richard Harris, NPR News.